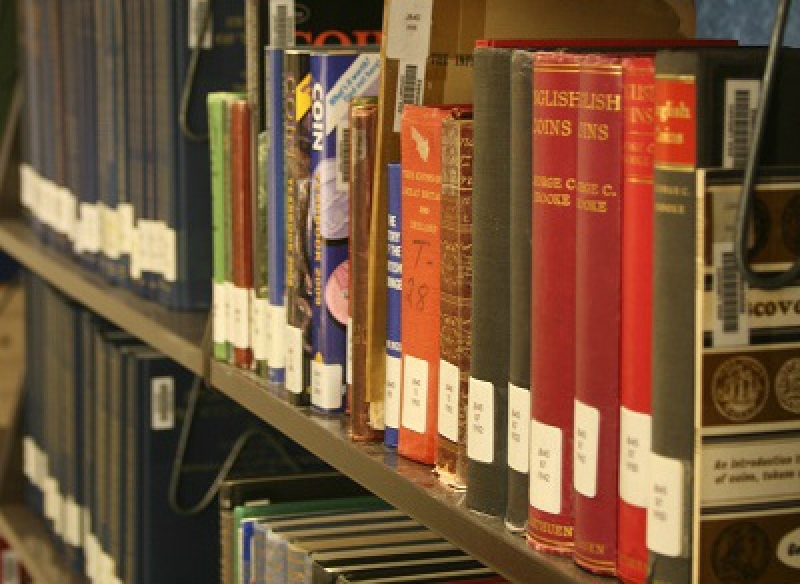 The Dwight N. Manley Numismatic Library is committed to providing the ANA membership and numismatic community with the most comprehensive research library possible. This mission in mind, we happily accept donations of catalogs, periodicals and multimedia items. However, due to space constraints, the library staff must be selective about what material can be accepted into the collection or stored for our annual book sale. 1. In order to make your library donation tax-deductible, it will be necessary to have your donation valued. Valuation must be done by a third-party appraiser prior to sending materials to the library. The ANA Library is not responsible for valuating donations, nor is it permitted to do so. If you would like assistance finding an appraiser, please contact the library staff. Books: All books will be accepted by the library regardless of whether they are already in the library's collection. If your donation is entirely books, no prior approval is needed - but please let the library staff know your donation is coming. Periodicals: Please send the library a full list of periodicals you wish to donate, including periodical name, volume number, issue and/or date of publication. Details such as whether a full volume of periodicals is bound should be included as well. Bound publications need only list volume number, but should note any missing issues within the bound volume. Auction catalogs: Please send the library a full list of auction catalogs you wish to donate. While exceptions may be considered for periodical and book donations, auction catalogs will not be accepted without this information. List details should include the auction company name, date of auction, number of duplicates, and availability of a prices realized list. Non-listed auction catalogs will be returned or discarded. Audio/visual: The library will accept DVDs and CDs in new or good condition. These items should be cleared by library staff to ensure they are not already in the collection. Other items: Materials such as artifacts, archival material, photographs, recordings and similar items should, under no circumstances, be sent to the library without prior discussion with the library staff. The library would be happy to consider adding items such as these into the archives and special collections, but space constraints and pertinence are very important when considering what kinds of materials can be accepted. 3. When shipping your donation, please include the itemized list with your package. This allows library staff to ensure that the entire donation has been received and reduces the time necessary to process your donation. The Dwight N. Manley Numismatic Library staff thanks you for your generosity. We appreciate and thank you for your cooperation in this matter.